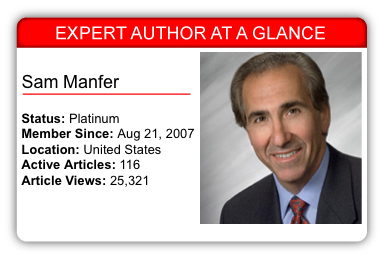 Today’s Expert Author Case Study introduces us to Expert Author Sam Manfer, who uses his personal experiences, along with humor and stories, to show salespeople how to implement his own sales strategies and tactics. Sam has coached and trained salespeople all over the world. From his experiences, he wrote a book titled “Take Me To Your Leader$,” and he continues to write articles in the Business niche. As part of our Expert Author Case Study series, we asked Sam several questions about his article writing and marketing experiences. First, my experience – twenty-five years of corporate experience as a Business Development Manager, Sales and Marketing Vice President and President of two companies. Second, my sales training – studied under Steve Heiman of Miller Heiman, where I became a certified seminar leader, and conducted hundreds of selling seminars. I also studied under Wilson Learning where I became a certified seminar leader and conducted seminars. Third, my speaking, seminar leading and consulting experience – fifteen years conducting hundreds of sales seminars, keynote speaking at sales meetings and consulting with clients. I’m also a Certified Speaking Professional (CSP) from the National Speakers Association. Finally, I write, produce and conduct my own selling and sales management seminars. Article writing, for me, comes easily. I use my daily experiences selling myself and the experiences of others trying to sell to me. There’s a wealth of stories and tips in this alone. I also use my daily consulting experiences. My clients run into a host of problems and need advice in a variety of different areas in the sales and management field. This, again, gives me a whole host of topics to discuss in articles. I also use topics from my books, manuals and seminars. So, there really is no secret. It’s just using all the available information I’m constantly exposed to, and turning it into a story, strategy, tactic and/or technique that’s outlined in an article or video. Motivation is easy. I’ve noticed that when I write and publish articles, the traffic to my website picks up, as do my sales. When I don’t write, it drops off. So, article writing is a no-brainer. I use my daily experiences and topics that I teach and coach. This provides me a wealth of article information. Eventually, I hope to broaden this into a related area of personal development, and an unrelated area of gourmet healthy cooking. Again, in both areas I have a lot to say and a lot of material. This is a difficult balance for me. I feel my quality is very good from the feedback I get from various sources. However, I have trouble keeping it short. I feel I need to explain the concept, outline the difficulties and use an example to get the point across. This takes me usually into the 1,200-word realm. I’d like my articles to be 500-700 words. So, I guess my advice to myself is to narrow my topic/concept, or make the article less detailed and encourage people to ask me for more detail if they’re interested. EzineArticles has been a great lead generator for me. I use Google Analytics and I see the traffic that’s generated from EzineArticles. Article marketing fits beautifully into my marketing plan. At this point in my life, 90% of my marketing plan is what I call passive marketing, which article publishing is a part of. It provides a venue for people to get to know me, trust me and hopefully buy from me. I like that EzineArticles ties into my Facebook, Twitter and even updates Squidoo. I don’t think I use nearly as many of the tools available from EzineArticles as I should. They could probably help me with lead generation appreciably. If I could start all over again, I would become an M.D. because I like fixing people. But, as far as article writing and marketing, I feel good about my approach into this field. If I can afford it, I’d like to hire someone to do all the technology work and submissions. My advice to newbies is to write from the heart. Tell your story, use your experiences and your ideas, and you’ll never run out of things to write about. Write From Your Heart – Be personal about the information you have to share. Tell your story. That’s the best way to build credibility and a real business relationship with your target audience. Use Everyday Experiences – Whether your work is related to your niche or you’re just really passionate about it, you live inside that niche every day. Generate articles based on your own experiences and be open to your next great article idea at any time. Keep Individual Articles Focused – If you stay focused on the topic you want to cover, you’ll be less likely to stray from your main message. When you are passionate about a topic, it’s quite easy to write a 1,000+ word article in a short period of time, but the length may cause you to lose focus on the main message. In that case, you might be able to break the article up into multiple parts. Tie Your EzineArticles Account To Your Social Media Accounts – Social media platforms are great ways to share your expertise with your audience. It helps to build the amount of followers or friends you associate yourself with. Build Your Credibility – Writing articles is an effective way to build credibility. It’s a platform where people can get to know about you. With enough credibility comes a special kind of trust. Without even having a face-to-face meeting with them, you can reach out to your readers and help them make good decisions. Use these quick tips to write and submit your next set of high-quality, original articles. Also, leave a comment for Sam and share one of your own tips. I like the way that Sam laid it out and I found the information to be very helpful. Thanks EzineArticles for doing this piece. I enjoyed reading your article. Sounds like it comes natural to you, and from your heart and good advice about doing a marketing technique that comes naturally. Thanks. I agree with you that all writing should come from the heart. Staying on the topic can be a bit tricky as well. There is so much to tell! To keep myself on track I break it down into 3 parts and refer to it as I go along. Congrats Sam – proud of you! This article is very informative, helpful, well written, and helps gives a lot of ideas related not only about writing well, but how many benefits you get from it. Sam, could you do me a favor, please, by sharing an advice on what could be the similarities in the way of writing and thinking about an article on health and a health book writing that is about health and eating habits? What is the best way to see its structure and keep it short and concise, whereas you can talk about benefits of just one vitamin for at least on 30 pages – but I would rather keep the entire book within maximum of 250-300 pages? Thank you very much. Marta. Hi, Sounds like it comes natural to you, and from your heart and good advice about doing a marketing technique that comes naturally. I pulled out a few more tips, but I liked that one best. The one tip I would add is on choosing the topic of your article. I have so much material it’s hard sometimes to pick what to work on as an article – and my best tip is to choose whatever it is that you find yourself talking about to friends most often. What is the thing that you are always being asked about… because often that’ll be the subject with the biggest audience! You article about Sam Manfer give me spirits and inspirations for writing much more. Thanks. some lovely pieces of advice.tying stuff to your social network sites is a good one,and the one on writing from your heart simply made my day.God bless you. I’m new to article writing and this was a great help. Thanks for sharing. The best thing I’ve learnt from this is the info about the length of the article and that you must just write from the heart. I suppose, it’s now just to make that firts move and get going! I sometimes forget to tie my articles to the social media. I am able to say with writing what I am learning to say in speaking. This is the talent that I have discovered when ask to just write it down. This is an excellent guidelines for newbies in article writing. Thanks a lot, Sam! Thank you Sam for the useful tips. Great post with lots of useful information for anyone writing articles…love your 5 Quick Tips! Hi Sam! I read the article with utmost interest and could really follow your difficulty to be concise and restrict your articles to 500 to 600 words limit. When you are rich with resources it is quite likely there would always be an overflow. Great post, I agree with you Sam, limiting your article to 500 words was a difficult task for me too, which I am getting much better in practicing and implementing this, I have the same opinion also about the importance of Social Media, since I started linking their accounts to some of my Web-Pages content, and article posting, I realized first hand the increase of traffic to my website. Thank you Sam, your articles very useful and gives me a lot of inspirations. Thanks for the interview with Sam. Great to know more and how to make use of it. Congratulations on a distinguished career path. Not all of us will have the kind of opportunities and exposure that you need so thank you for sharing your skills and knowledge. which I am getting much better in practicing and implementing this, I have the same opinion also about the importance of Social Media, since I started linking their accounts to some of my Web-Pages content, and article posting, I realized first hand the increase of traffic to my website.